Corporate documents, photos and a video reveal more about the new slate. 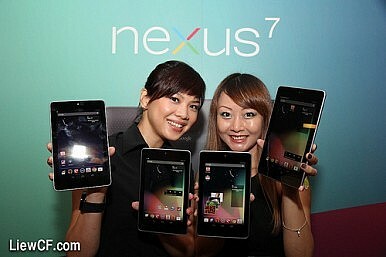 With an official Google event scheduled for July 24, the company may ship the much-anticipated Nexus 7 2 tablet to retailers as early as Monday. Documents leaked to Engadget allegedly confirm Asus as the manufacturer and list July 20 as the expected arrival date for Google’s new 7-inch slate. All signs point to the July 24 event being both the product unveiling and sales launch. The document photos come from U.S. office supply and electronics retailer OfficeMax, detailing visual planning guidelines for the Nexus 7 2’s in-store display (as well as new slates from Samsung). Also revealed is the new tablet’s “current retail” price, set at $269.99 for the 32GB model (and $229 for the photo shy 16GB model, according to The Verge). “A tablet revision is being done to add in the new Samsung Galaxy 3 7-inch and the new Google Nexus 7 to all stores,” read the “Merchant Strategy” section of the leaked documents, which Engadget claimed were sent by an anonymous industry source. The OfficeMax instructions mention only the 32GB model of the Nexus 7 2. Along with the new Samsung tablets, the older Nexus 7 will be sold alongside its successor, likely until inventory sells out. On top of the leaked documents sent to Engadget, photos and a video of the purported Nexus 7 2 were also sent to AndroidCentral. A sticker on the back of the pictured device reveals a full spec sheet. Processing power will come from a Qualcomm Snapdragon S4 Pro CPU, not the rumored (and higher-spec) Snapdragon 600. The Nexus 7 2 will pack an impressive 4GB of DDR3L RAM, and run on a 3950MAh battery. The slate shown in the photos has 32GB of ram, but a 16GB model is also likely. The new Google tablet will also have dual stereo speakers and dual cameras this time around. “There's a 1.2-megapixel shooter from LITEONMOBILE on the front, and 5-megapixel camera by Chicony on the back. The rear camera appears to be situated in the same corner as the 3.5mm headphone jack,” said AndroidCentral. The new Google slate is all black, sports a thinner bezel than the original, and opts for a smooth flat-black finish on the back casing with the Nexus branding inscribed horizontally. As is the case with leaked gadgets, the apparent Nexus 7 2 shown in the photos could be a prototype and not the final piece of retail hardware. Tune in to Google’s “Breakfast with Sundar Pichai” event on July 24 to get the final word.